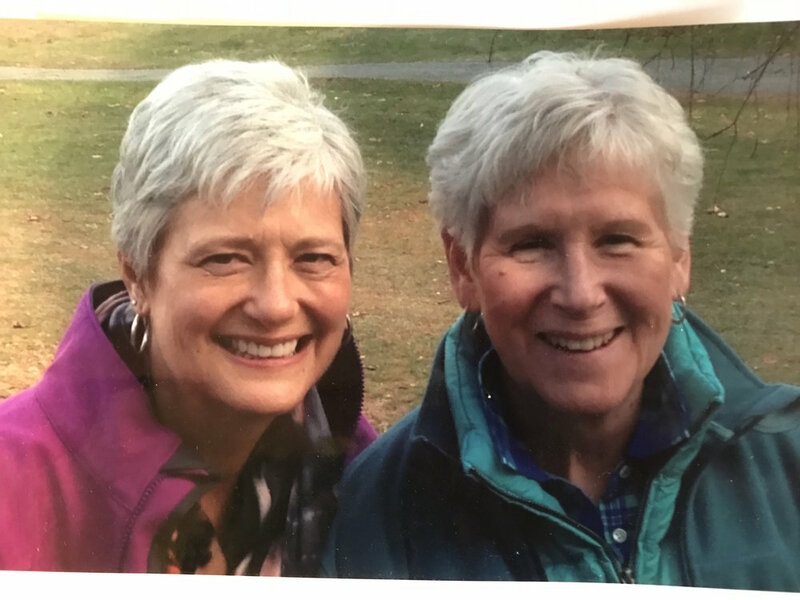 Barbara, right, and her sister, Ann. My recipient was my sister, Ann, who is 10 years younger than me. Ann was 49 when her doctors started to talk the need for dialysis. She had a son in college and twin daughters who would graduate high school in the spring. In my mind, Ann was young and full of life and I wanted her to be able to continue life, without the confines of dialysis. I felt blessed to be able to be her donor! For me, it was an easy decision! My grandmother, father, brother, and sister all had Polycystic Kidney Disease. I was the only one of the three kids in my family that did not inherit the disease. This was my way to share my healthy body with her. I think it is natural to have some concern about any surgery, but I also had great faith in the doctors that my sister and brother-in-law had selected. Our surgery was in Connecticut, so I would have to be away from home for 2½ weeks because the doctors wanted my follow-up appointment to be there. I’d never been gone that long. My biggest concern though was I don’t deal well with anesthesia, which I knew from previous experiences. My surgery went as expected and as I recall was about 3 hours. I had warned the doctors about my anesthesia concerns, and that was indeed my biggest hurdle. Surgery was early morning, and I didn’t really come out of the anesthesia till about midnight. I vaguely remember doctors and nurses trying to arouse me, but I couldn’t stay awake. However, the next morning my eyes were open, and I was alert! Once I came out of anesthesia, I remember some discomfort, but the next day I took a shower and was able to slowly walk to my sister’s room. I spent two nights in the hospital, and I don’t remember much about the food. I was at my sister’s house for 2½ weeks surrounded by her and her family, which was a treat. I’d usually only see them once a year and never for that long. My husband was also there for a week. I remember my first walk was to the mailbox, but every day I was able to go further. I took Colace for constipation which was helpful and got off pain pills pretty quickly. Having a small pillow to hold over the incision made that feel better. We took a nap every day. The cards and phone calls from home were encouraging, and the meals Ann’s friends provided kept us nourished. Ann’s surgery went fine except that the doctor nicked a nerve and she had no feeling in her leg for three months and had to use crutches. We learned that is one of the possible hazards of surgery, but the doctor assured her that the nerve would heal with time and it did. So we really took it easy but spent some really quality time together! It took a couple of months to get my strength back and I remember looking forward to a nap which was foreign to me before this surgery. The doctors stressed the importance of drinking lots of water daily, and I found that is a necessity or I start to feel dehydrated. Obviously, that is not difficult to do and I mention it just as a tip for donors. It was fortunate that our surgery was in May so the school year was ending when I returned. At the time I was a preschool director and had limited time in the office anyway during the summer and was able to spread that out at my convenience. It was five months from start to finish. An interesting side effect was my taste buds left me for a few months, especially with coffee. I never expected to hear the word “hero” referring to me, but family and friends were so supportive in action and prayer! I realize now that it is the greatest gift I will ever give to anyone. Aside from a successful transplant, the best result of this experience is the relationship between my sister and I is stronger than ever. We love to talk on the phone, and have taken some trips together and enjoy making the most out of life! Ann has always been a super positive person and has continued to enjoy life. She has had a couple of serious health issues since our transplant, but she amazes all of us how she bounces back. I couldn’t have given my kidney to a more deserving person. My decision to do this was easy since it was a family member and I’d do it again if I could. To me, the real heroes are the people who donate to someone who is not family. That is truly a selfless gift! Aside for some discomfort, it is not a hard surgery, AND you will forever know that you have changed someone’s life! Donate life!